If You Only Expect the Very Best! Watkins Black Pepper was awarded the Gold Medal for excellence at the 1928 International Exposition in Paris and you'll find it is of the same high quality and flavor today. Watkins buys only the very best quality Malabar and Lampong peppercorns, then granulates them using an exclusive granulation process, which preserves their high essential oil content and flavor. This process and Watkins attention to quality also means our pepper is less likely to make you sneeze! Experience the Gold Medal-winning taste of the most flavorful pepper on the market, available in a 2 oz, 6 oz. or economical 12 oz tin. Order your Watkins purest granulated black pepper in our safe, secure Watkins store. You’ll be glad you did. Did you know that black pepper is used in almost every cuisine? In fact, black pepper is the world's most popular and important spice! Following is what you need to know about pepper including the difference between granulated and ground pepper, why pepper makes you sneeze and it's health benefits. Why is Watkins pepper granulated not ground? Grinding crushes the peppercorns which releases the essential oils and exposes them to oxidation. Ordinary store bought ground pepper has a shelf life of only a few months. This pepper loses it's flavor and aroma through evaporation of the essential oils and when exposed to light, stored in clear glass or plastic containers for example, your pepper can transform into a nearly tasteless spice. You’ve probably noticed that top chefs and expert cooks always recommend freshly ground pepper, now you know why! Ordinary ground pepper simply loses it's flavor in a relatively short period of time. How Watkins black pepper is different. Watkins secret granulation process dramatically increases the essential oil content and produces a black pepper with unparalleled flavored. When stored in it's original tin away from heat, Watkins pepper tastes and smells as good as it did the day it was produced for several years. Low quality pepper contains fillers, stems, dust and other impurities that are ground up along with the peppercorns, these impurities or fillers are what cause you to sneeze. Watkins carefully screens out any fillers and stems before granulating the most potent varieties of choice grade pepper corns, this makes it virtually sneeze proof! Try it and see for yourself. 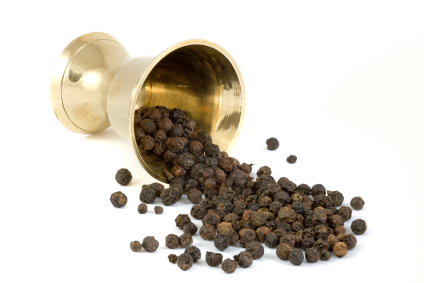 You might be surprised to learn black pepper has health benefits! Pepper is known for it's ability to stimulate digestion, aid the digestive system and intestines. In fact, black pepper is one of the ingredients in a number of Watkins dietary supplements including Super Food multi-vitamins. Watkins only offers you pepper and other products that have not been treated with food irradiation. Since many people are concerned about what the eat and feed their families, they want to avoid foods that are irradiated or contain pesticides. Food irradiation is the process of exposing food to ionizing radiation to destroy microorganisms, bacteria, or insects that might be present. However, food processed by radiation has damaged DNA, which changes the chemical composition and impairs the flavor. This process is often used as a subsitute for good hygienic practices in the storage and processing of food. Pesticides are another concern so Watkins ensures peppercorns are free of pesticides. You can be assured Watkins high quality standards and attention to cleanliness during processing means you can enjoy the best tasting pepper with out worries. Watkins the pepper experts offer you a variety of pepper choices including granulated black pepper, expertly crafted pepper blends and pepper corns. Watkins original award winning Granulated Black Pepper is perfect in any savory dish and for filling your pepper shaker. Lemon Pepper is a no sodium pepper blend, it's great on fish, chicken, and grilled steaks. Onion and Garlic Pepper is great on any meat, and is an all-purpose, no salt savory blend. Plus you can also choose from a variety of gourmet pepper corns to fill your pepper grinder. 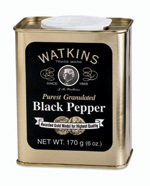 Did you know Watkins is the only brand of pepper allowed to be labeled as purest? If you’ve ever been tempted to buy cheap pepper don't waste your money when it costs so little to treat yourself every day with gourmet flavor. Believe it or not Watkins pepper has more flavor than cheap brands so you'll use less and save money. You can shop for Watkins black pepper in our safe, secure Watkins store or request your free Watkins full product catalog and order by mail or phone. Did you enjoy this information? Know someone else who would enjoy it too? Please share it with them and feel free to add this page to your bookmarks or favorites: Thanks in advance for shaing this page with others, your referrals are appreciated! 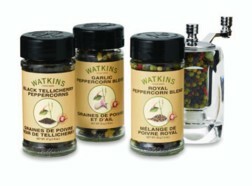 Watkins Pepper And Other Products Are On Sale! 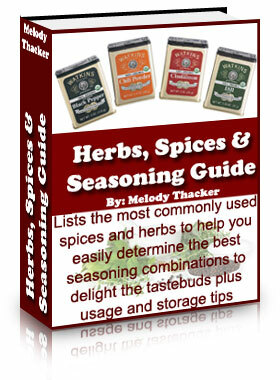 You'll receive a free copy of our Herbs, Spices and Seasoning Guide filled with tips on using herbs and spices and much more plus exclusive offers not available any where else! * Note: Your customer account # and State/Province is optional, entering them will simply enable us to provide you with better service. We care about and respect your privacy.